Definition at line 26 of file LegacyDivergenceAnalysis.h. 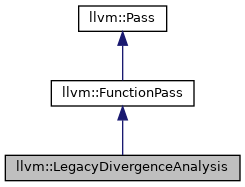 Definition at line 30 of file LegacyDivergenceAnalysis.h. References F(), getAnalysisUsage(), llvm::PassRegistry::getPassRegistry(), llvm::initializeLegacyDivergenceAnalysisPass(), isDivergent(), print(), and runOnFunction(). Definition at line 290 of file LegacyDivergenceAnalysis.cpp. References llvm::AnalysisUsage::addRequired(), llvm::containsIrreducibleCFG(), F(), llvm::DivergencePropagator::FuncRPOT, llvm::DivergencePropagator::LI, llvm::AnalysisUsage::setPreservesAll(), and UseGPUDA. Definition at line 347 of file LegacyDivergenceAnalysis.cpp. Referenced by llvm::SITargetLowering::isSDNodeSourceOfDivergence(), isUniform(), and LegacyDivergenceAnalysis(). Definition at line 51 of file LegacyDivergenceAnalysis.h. Referenced by hasOnlyUniformBranches(), and isUniformlyReached(). Definition at line 354 of file LegacyDivergenceAnalysis.cpp. References Arg, llvm::Function::args(), llvm::Function::begin(), llvm::Function::end(), llvm::Function::getFunction(), llvm::Value::getName(), llvm::Instruction::getParent(), llvm::BasicBlock::getParent(), llvm::BasicBlock::instructionsWithoutDebug(), and llvm_unreachable. Definition at line 54 of file LegacyDivergenceAnalysis.h. References llvm::detail::DenseSetImpl< ValueT, MapTy, ValueInfoT >::erase(). Definition at line 311 of file LegacyDivergenceAnalysis.cpp. References llvm::dbgs(), llvm::DivergencePropagator::DT, F(), llvm::Value::getName(), llvm::GlobalValue::getParent(), llvm::TargetTransformInfo::hasBranchDivergence(), llvm::DivergencePropagator::LI, LLVM_DEBUG, llvm::DivergencePropagator::PDT, and print(). Definition at line 28 of file LegacyDivergenceAnalysis.h.